This was taken at a Natural Resource Center(fancy name for park) in North-eastern Maryland. When I came upon this after a walk on an early fall morning I noticed how the early sunrise was hitting the trees and the bridge. I used a polarizer filter to darken the sky in the background, and later when viewing I decided it would look great in B&W. 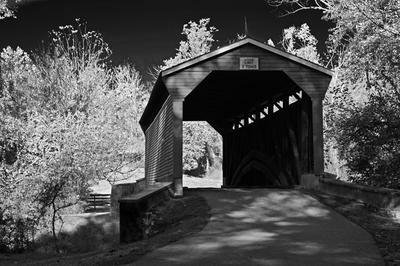 I converted to B&W in elements and took it from there.I wanted to show perspective walking to the bridge form a short distance. Now this is a black and white photo that I really like! Personally, I like black and white photos where the blacks are inky, and the whites are bright. Milt has whipped his polarizer filter out to do this, and, unfortunately, without an awful lot of Photoshop trickery, the effect of a polarizer filter is impossible to replicate any other way. 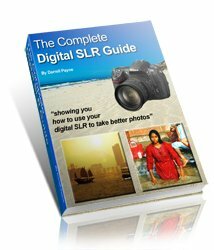 Of course, to use one you'll need a digital SLR camera, which once again goes to show the flexibility that digital SLRs have over compact cameras. That said, if you just want to achieve those lovely blacks and whites, there's a tutorial here on creating the best black and white photos. The tutorial uses Photoshop, but you can also use pixlr.com - an online photo editor. Thanks for the submission Milt, and if anyone's interested, take a look here to find out more about the advantages of digital SLRs.